To have your name appear in a song title written by someone no less than Mark E. Smith – a man not often thought to be the greatest respecter of reputations – says much about your standing in the world. The song ‘I Am Damo Suzuki’ appears on The Fall’s 1985 album, This Nation’s Saving Grace. Two years before that Damo Suzuki had set out on what has since become his never ending world tour. Tonight he stops off in York and in keeping with all the shows that have gone before it, he performs with a band made up of local musicians. Chuck Berry used to employ a similar operating model. But whereas the late American rock’n’roller’s motives for doing so were aimed at dramatically reducing his payroll – which comes as no little surprise given the huge sums of money he was routinely having to shell out on class action suits filed against him because of his depraved behaviour – the Japanese musician’s reasons for drawing upon a network of hundreds of different musicians across the world are based entirely upon his need for spontaneity and artistic expression. Damo Suzuki’s band tonight comprises five York-based musicians who are veterans of various local outfits – Dave Potter the group’s leader on MIDI, Tim Wright (synth bass), Ola Szmidt (vocals and flute), Martell James (drums) and Mark Peters (guitar) – plus Suzuki’s fellow countryman and former Boredoms’ percussionist E-da on congas. As if to reinforce the wholly impromptu nature of the occasion, they had only had two full band rehearsals beforehand and those were completed without Mr Suzuki himself being present. But you strongly suspect that pre-planning is not one of Damo Suzuki’s guiding principles in life. He is rather a man who favours freedom, inspiration, extemporaneous interaction, natural communication and a firm belief in living life in the moment. Musically such a strong emphasis upon improvisation does not always work – as a fairly incoherent performance a few years ago at All Tomorrow’s Parties in Minehead will firmly attest – but when it all comes together, as it most surely does here tonight, it is such a thrilling experience to behold. Now 68 years of age and having faced two battles with cancer –once in the early 80s and again more recently, this time in relation to his colon – Suzuki’s is nothing if not resilient. Wearing a “Free Hoshino” T-shirt – showing his continuing support for the man who was allegedly wrongly convicted for the death of a riot police officer in the so-called Shibuya Riot incident of 1971 – his strong moral compass and search for the truth are similarly undiminished. These powerful personal characteristics course right through his music giving it both strong spiritual purpose and meaning. 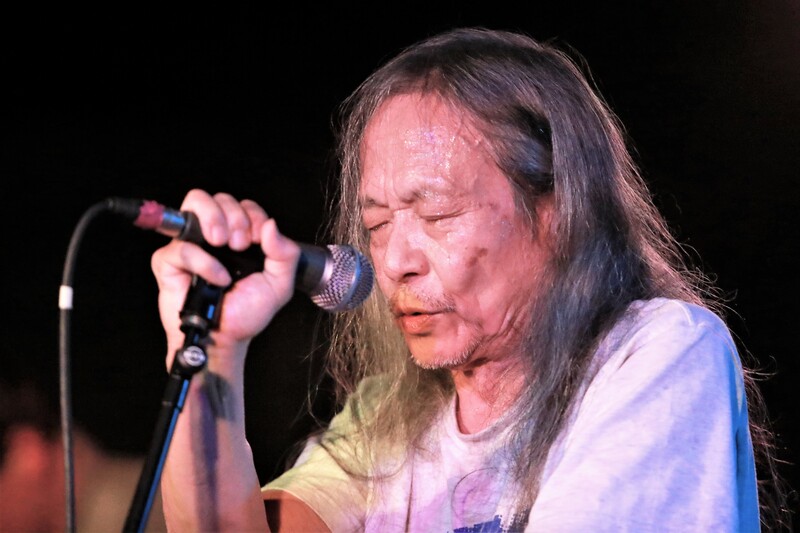 For 45 intense minutes tonight Damo Suzuki and his excellent ensemble hold a packed Crescent audience in their thrall. Through the course of one long, continuous musical journey the seven musicians navigate their way across what is a huge sonic landscape, one that criss-crosses continents between Africa, Asia and Europe. Over an abstract wall of euphoric sound – one that ebbs and flows with undulating rhythm – Suzuki transmits stream upon stream of cosmic consciousness in a strange hypnotic delivery that merges Japanese with English and a slew of amorphous words. His voice vacillates easily between that of a shaman Sinatra and Tuvan throat singer. There is even a moment when I swear I can detect the refrain to Can’s ‘Halleluhwah’, a beautiful reminder of the four years he spent as a member of those great German experimentalists during what was their peak period.